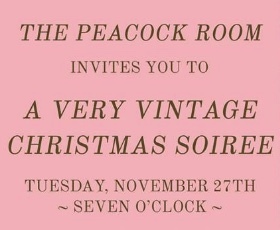 Who Doesn’t Love a Vintage Christmas Soirée? Local fashion boutique, The Peacock Room, located in the Fisher Building downtown Detroit is hosting a Holiday soirée Tuesday, November 27th at 7pm at Willis Show Bar. Guests are invited to enjoy a special Holiday performance by Sara Marie Barron & Her Band along with tunes spun by The Dapper DJ Willa Rae.